This was certainly one of the most interesting books I’ve read in quite some time. I’m not sure how one would define this. Quirky romance? Bizarre-o horror? Oddball thriller? I also don’t think I’ve ever gone through as much of a pendulum swing in liking/disliking a book, while reading it, as I did with this. In the town of Hokum (which right off should send the reader a message), Billy Rubino is a young man (one gets the feeling that he’s just out of college-aged) who doesn’t want to work too hard at anything. He runs for office as the City Coroner and gets the position (because no one else wants it). Through the course of his work, Billy works with strange locals, including a man who refuses to believe Billy was correct in reporting that his family is deceased and is constantly haranguing Billy to fix the paperwork. There is also the girl junkie who tries to kill herself, but fails, and because she has nowhere to go, finds herself staying at Billy’s place. But when the chips are down, the lazy-assed Billy finds himself in a place where he can make a difference. Will he step it up or let it go? Mind you…I don’t mind looking up words. I enjoy getting a little smarter by knowing new words. But having to do this takes me out of the story and I started to think that Canterel was just trying to show off how smart he was. His pomposity and being taken out of the story had me about ready to close the book for good. But this use of unusual words was limited to the very early chapters of the book, and I began to wonder if Canterel did this on purpose to help show us what a jerk Billy Rubino was. He does say about Billy: “It was a fact that Billy was overly fond of long, drunken conversation, which usually took a philosophical bent and never varied despite the character of his audience” which seemed to go along with the language Canterel was using. Later, Canterel writes: “One can only judge one’s vernacular against the fundamental grammar of his society, provided of course that one is surrounded by well-spoken people, otherwise one must speak the language of the insane, which isn’t really a language at all.” Clearly, the use of words Canterel chooses is very intentional. Suddenly, I’m a little more interested. Canterel is working this story on many levels. I started to enjoy Billy as the story went on and his speech to the masses during the onset of a disaster had me howl with laughter. This is easily the strangest book I’ve read in a long time and I just don’t know how to rank it. If you like books such as Catch-22 or A Confederacy of Dunces, this might be up your alley. But this could also be the sort of book that you start to read and then close and forget about it. Part of me wants to give this two stars and part of me wants to give it four and a half. I guess we’ll meet in the middle. Looking for a good book? 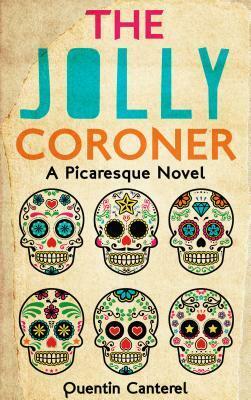 The Jolly Coroner, by Quentin Canterel, is an odd-ball novel that isn’t for everyone, but if you don’t mind quirky humor and David Lynch-like characters, and maybe feeling a little stupid now and then, this is the book you’ve been looking for and won’t find very often.